“It was a particularly hard winter but every morning I’d be cycling the kids through the snow; a cargo bike was part of the relocation package,” says Walker. 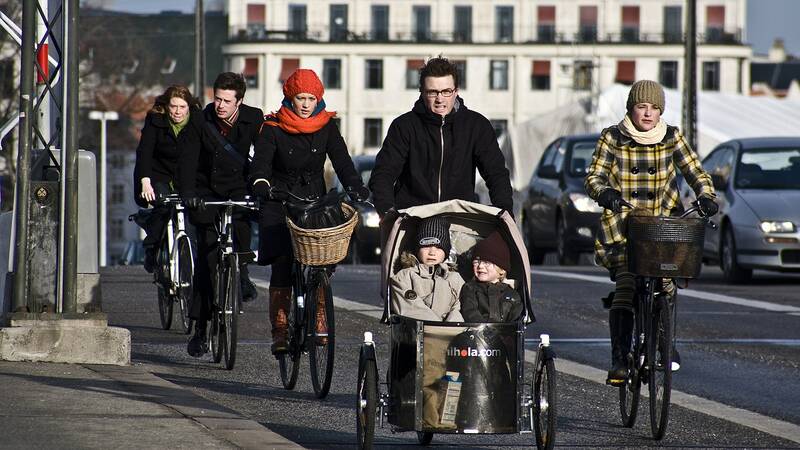 The wholesome Scandinavian lifestyle is luring a growing number of British families and young professionals to Copenhagen. Research by the relocations company Move Hub shows a 580 per cent ­increase in people relocating to the Danish capital in 2017, drawn perhaps by popular images of hygge, the cosiness trend that took off a few years ago. Those who already live in Copenhagen, however, insist that it is a rather different concept to the roaring fires, sheepskin rugs and minimalist furniture portrayed in the British media. This misses the point, says Kate Rayden, who moved to Copenhagen last year to study political science at Copenhagen University, and works part-time as a copywriter. “It seems forced and commercialised in the UK, whereas here it is more of a state of mind,” she says. “It’s about creating a cosy atmosphere and enjoying good company. It’s not so much about physical stuff.” People are more laid-back in ­Copenhagen, she adds. They cycle to work, taking time to enjoy their ­surroundings. The city is clean with plenty of parks and trails along the coastline. The Walkers live in the suburb of Gentofte, twenty minutes from the city centre, where there are large villas surrounded by their own gardens. Also popular with families are the suburbs of Charlottenlund and Hellerup, which has a renowned international school, and the super chic Østerbro, which is within walking ­distance of the centre. Young professionals, meanwhile, tend to live in districts such as once-seedy Vesterbro, with its hipster coffee shops, a vibrant nightlife and the famous Mother pizzeria. They also flock to the even edgier ­Nørrebro, with its art galleries, basement bars and weekend markets. Living in Copenhagen is not cheaper than in Britain. Eating out is expensive and taxes are high – the average Danish citizen pays around 40 per cent personal income tax. “But wages are higher,” Rayden argues. “And education and healthcare are free, plus public transport is heavily subsidised.” When it comes to accommodation, however, you get more space for your money than in London. According to estate agent Mads Bruun of RealMæglerne, a large two-bedroom flat with a balcony in Vesterbro will cost around £1,200 per month to rent and £300,000 to buy. Meanwhile, a four-bedroom house with a garden in ­Hellerup costs from £4,000 per month to rent and from £700,000 up to £4 million to buy. Bruun finds that around half of his clients relocating to the city for two years or more decide to buy rather than rent. The city also offers co-operative housing schemes, a cross between renting and home ownership, where you buy a property and pay a monthly fee to a ­residents’ association. Spacious co-op apartments are available from £250,000. ALI WALKER has lived in Copenhagen for six years, KATE RAYDN for one. ANNA TYZACK is a writer and former commissioning editor at The Telegraph.